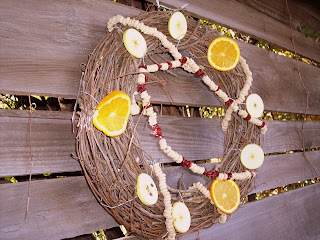 Make garlands by stringing the foods on the twine. Older children can use the needle to pierce cranberries, etc. ; young children can easily string cheerios. Wrap the garlands around the wreath and hang your "feeder" in a place that is very visible to your children. For me, a big part of the fun of having bird feeders is watching my children watch the birds.